I can’t not talk about it (yeah, I see the double negative)...I really wanted the Eddie Dye roadster to win the AMBR. Yes, it’s an incredible piece of history. Seeing it in the same room as the Niekamp car gave me chills like most everyone else who knew the significance of the event. Yes, it graced the cover of this very magazine so many years ago. Yes, many talented people we call friends worked countless late nights down to the wire to make it happen (a huge feat in itself). Those things matter. A lot. The other thing I selfishly hoped for, after seeing Daryl Hollenbeck’s roadster take the big award two years ago, was that the tide was shifting. That the powers that be were taking into account aesthetics (the word “beautiful” is in the title) and that historic aspect would have some impact. The Eddie Dye Roadster owned by the Bobowski family , same family who restored the Pierson brothers coupe with South City 2 years ago. The roadster was resurrected by Jimmy White and Crew of Circle City Hot Rods in Orange ,Ca. and paint and body by East Bay Speed and Custom In Concord ,Ca. The Dye car did take the Bruce Meyer Hot Rod Preservation Award as well as best paint. Well deserved. And judging by the crowds, it definitely felt like the people’s choice. As usual, there were other roadsters in the running that exhibited exceptional craftsmanship and ingenuity. I don’t mean to detract from their efforts and congratulate the Hot Rods and Hobbies crew along with the Martins on their victory. The Martin roadster is truly a work of art, It totally deserves the award for Americas Most Beautiful Roadster ,as its Build is on top of a real deal history roadster and has been in the Martin family for the last 40 plus years as a driver. It in the bare metal state has been raced a few times at speeds over 100mph and the car will not just see a garage , she's a real driver and it will be used as one. Amazing work by Scott and the gang at Hotrods and Hobbies. The Hop Up booth overlooked the huge Rolling Bones display along with the staging and starting line equipment from the Hot Rod Climb. What a sight! I think most 2 door ’32-34 models and several A’s with a serious chop was represented. There were plenty of customs displayed throughout the Fairplex. 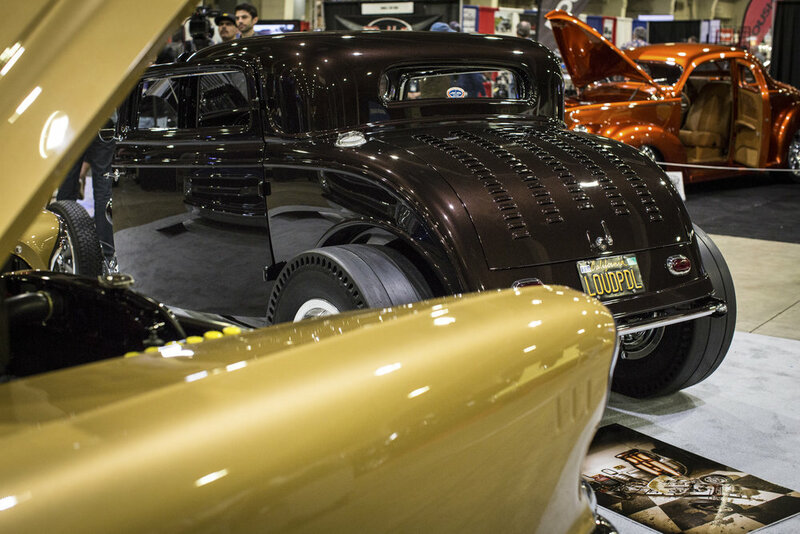 Just a couple that caught our eye were Cliff Mattis’ subtly stunning ’41 Buick; Roger Miret’s flamed, flaked, and paneled ’54 Chevy; and Russ Meeks’ incredible ’55 Crown Victoria over in the Suede Palace. Speaking of the Suede room, it proved again why it ends up as possibly our favorite every year. Pure hot rods, race cars, bombs, and everything cool in between packed the palace. If you’ve been to the show, you know there are too many rooms filled with all sorts mechanica for me to describe without droning on for hours. And the stereotypical southern California weather lived up to expectations which brought the drive-in cars to capacity. All in all, it was a great year. So many people worked their hearts out to debut new builds, freshen up old favorites, and put some more vintage tin on the road. Hanging with our friends is the highlight for us and we can’t wait until it’s time to do it again. Until then, get wrenching!